Territory. 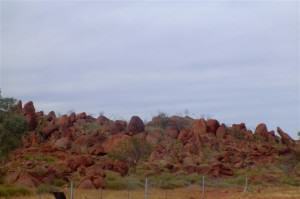 On our southward journey down the Stuart Highway we stopped at the village of Dunmarra for coffee. This is not much more than a roadside stop along the highway and got its name from a man named Dan O’Mara who went missing in these parts many years ago. His body was never found and the local Aboriginal people who helped in the search couldn’t pronounce his name. They called him ‘Dunmarra’. restaurant, and fuel, it’s an oasis. During the building of the Australian Overland Telegraph Line in 1872, Doctor Frederick Renner, the medical attendant for the team working on the line, noticed a large gathering of birdlife and discovered the springs that now bear his name. 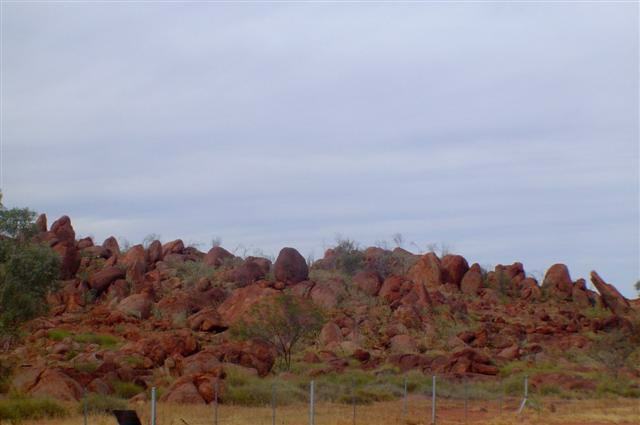 11 kilometres (7 miles) south of Renner Springs you will find Attack Creek and a monument marking the place where explorer John McDouall Stuart encountered hostile Aborigines on his first attempt to cross Australia. 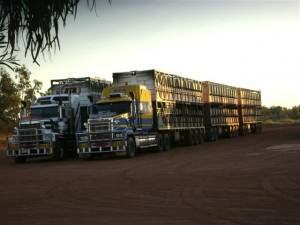 The trucks are BIG in the Northern Territory! They’re called “trains” for a reason! highway speed limit of 130kph (80mph) it’s best to stay out of their way! If one of those OMG ones passes you at that speed I think it would create a pressure wave that would just about blow you off the highway! And if you happen to come up behind a slow one (rare but it has been known to happen – once in 1965, I believe), well, you had better hope that there’s about 10 kilometres (6 miles) of straight road ahead because I reckon that’s what it will take to get past! take place. 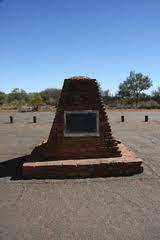 These are important ceremonies for the Warumungu people who have been in this area for thousands of years. I particularly wanted to have a look at the Pebbles and we drove out there this afternoon but I must admit that I was a little disappointed in them. I don’t know what I expected but they simply don’t have . . . I suppose, the magnetism or the allure of their larger cousins. 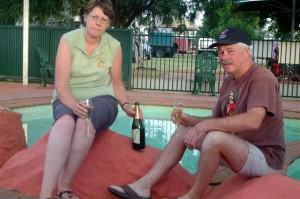 returning to camp where we settled down by the pool with our bottle of Two Tails Sparkling Wine. This was a little sad because instead of “first night bubbly” this was also for our last night in the Territory on this trip. The sun was setting on another beautiful day and tomorrow we would be on our way to Queensland for the next chapter in this adventure of ours. But for now we watched to sunset, listening to the sounds of the night as darkness settled over us like a blanket. 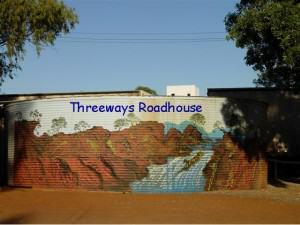 Threeways Roadhouse is the perfect way-point. With accommodation ranging from camping sites to motel rooms, a swimming pool, and a restaurant/ takeaway with a licensed bar, it is THE place for weary travellers along the endless kilometres of the Stuart Highway.